Question about closure for a felt pouch and rich deep colours are hard to photograph! Yesterday I forced myself to sit down to stitch and finish 5 of the 6 little felt pouches I felted on Wednesday and Thursday. Making the descision to participate at Borris Farmer’s Market each Friday for the forseeable future in addition to focusing on stocking my Big Cartel shop has meant that I am sticking to my guns and continuing to develop a range of small but colourful felt pouches. As many of you well know by now felting is my big passion, not stitching. I do however appreciate that elective stitching can add another dimension to hand made felt, hence my current discipline in this department!!! I love this starburst design! The only reason that I didn’t manage to finish all of the pouches is the fact that I need to figure out a different closure for pouch number 6, the starburst design on the flap really deserves to be shown off and not cut into for a button hole! I’m toying with the idea of velcro but do any of you experienced seamstresses have any suggestions??? All help gratefully recieved! My other difficulty is capturing the turquoise background of some of the pouches and revealing the richness of the blues and greens in the mohair off cuts when I post pictures of these pieces online. It seems almost impossible for me to share the depth of the colours over the internet but hopefully people will get the jist of the colours and anyone actually buying a pouch online will be plesantly surprised when it arrives in the post! The image below is a good case in point. The colours of the mohair piece on the flap of this pouch change subtly from rich green through to a deep blue viewing from left to right but I just can’t seem to capture them accurately. I can get the textured effect of the stitching but not quite the correct colours, never mind, I like this photo anyway and I just love the vintage button closure! 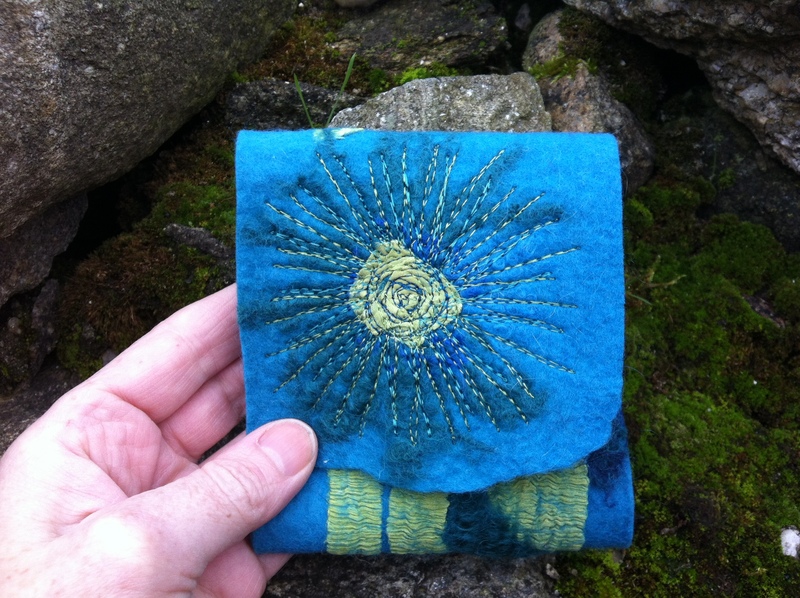 This entry was posted in Felt, Felt for sale and tagged Felt, felt pouch, Felting, free machine embroidery by Nicola. Bookmark the permalink. One simple closure is to take a piece of elastic and make a loop. Sew it to the inside of the flap, loop pointed down when the flap is closed. Then sew a shank button to the outside of the pouch and use the elastic as your “button hole”. No cutting at all. Have you seen these? They are magnetic closures and only 1cm wide. Could the disc part could be sewn beneath the starburst using stitches that go through the existing pattern? The only worry would be if the magnetic catches had too strong a pull. I wonder if you can get even smaller ones? Photographing colours accurately makes me tear my hair out. I can make a lovely piece of felt then spend hours taking various shots of it only to find that not one of them reflects the colours I can see with my eyes! If anyone has the answer I would like to know too. Anyway, I agree, the photo is lovely even if it’s not accurate. Here in the US we can get small circles of Velcro, approx. the size off a nickel. These are used frequently on commercial pieces of clothing…they don’t add bulk and are easy to attach by hand and work just fine. If you can’t find them, let me know and I could send some to you. Add a little strap (loop) on the inside of the flap (perhaps using something elasticated like those hair elastics that come in a range of colours – cut it to size and sew it on firmly on the inside of the flap) and sew on a button on the pouch itself and hey presto. Velcro and felt are not a marriage made in heaven in my humble opinion. And now I have read the other suggestions and see that my idea has already been aired… Sorry for repeating! I will suggest you to use a press stud, which you can sew on the inside, with stitches that is invisible on the font. An ides similar to the magnet. I think that velcro messes up too fast, with fibres stuck in it. Hi Nicola – You must be so proud of your stitching abilities getting better all the time, just love seing how your work developes. I use non sew magnets on my purses and bags – sewn and felted ones – and it works very well. I would be very different and use a slash cut and an attached toggle made of felt. The photography although beautiful outside you need with the blue to get a white balance for the camera to capture the blues better,try shooting on awhile background. Charming pouches of gorgeous color! I’d use a small felted “rope” stitched behind the flap and enclosed with an oval-shape toggle made of felt. The toggle with some glass beads will make it easy to slip on. Well looks like you have plenty of ideas to choose from on the closures….Some great ideas, and wow, when you ask a question, you get results!!!! I am so impressed with your beautiful stitching…Love the starburst effect…It’s really beautiful!!! Good morning Nicola….Your little purses are great. What I would do with your closure problem is make a thin felt cord……stitch it to the underside of the flap, in a loop form to be big enough to go over the button you will use for closure. then cover the stitched part with the same color felt, probably it will felt to cover the stitched part. When you sew the button on for the closure…..reinforce the underside with a small piece of matching felt to give it more support and will not tear the felt. This should work. Love the look of these small pieces and I am sure they will sell well as there are 100 uses for this size little purse. I’ve a question about the magnetic closures which I’ve used on small purses, but with a worry — how are they with magnetically sensitive stuff like phones or credit cards?? Read up and heard that they should be okay on a regular purse because they are not usually next to the magnet but what about smaller stuff purses where stuff passes awfully close. I’m too chicken to demagnettize my own credit card in the name of felt science…. No one suggested them — but I found that snaps were ~not~ a good solution. Needed to pry them apart as gently pulling on the felt does not separate them gracefully. Thought that the grommets (may seem to have a different name in the UK but being ‘foreign’ can’t recall what my sewing shop calls them…) that Andrea Graham described (you linked to her a while back) were good looking…but they seem a pain to put in. Oh such a good question — thank you! !